Dixit, the multi-award winning game in which your imagination unlocks the tale, is back with a new expansion! Enhance your Dixit experience with 84 new cards. Dixit Revelations (Dixit 7) lifts the veil on an uncanny, secret world. 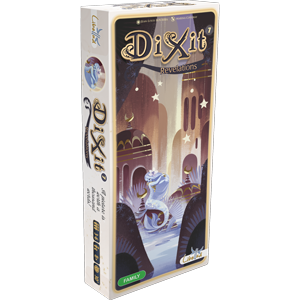 This sixth expansion for Dixit is designed by Marina Coudray, an illustrator working in advertising, publishing and animation. Follow her to a refined, delicate world full of poetry. Her bright, gentle design will lead you to surprising new horizons.